Pompe doseuse numérique à débit constant réglable manuellement, ou avec commande temporisée. 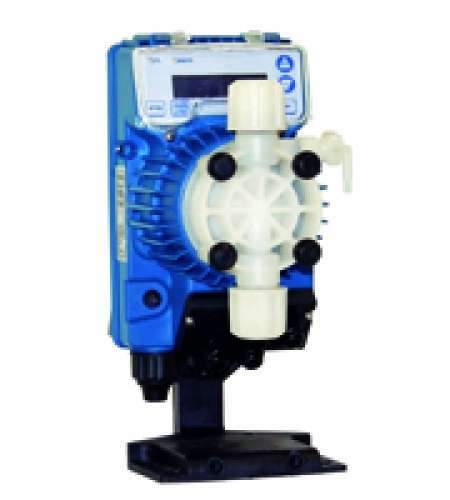 Digital dosing pump with constant flow rate manually adjustable, or timer control with a programmable timed relay. Tekna TCK series comes in 4 sizes, and can cover a range of performances, with a flow rate range from 2.5 to 110 l/h and a back pressure from 0.1 to 20 bar. The power supply is 100÷240 Vac – 50/60 Hz , therefore the same pump can operate with different supply voltage. The standard pump head is in PVDF, therefore high chemical compatibility with several liquid ends but is available in PVC as well, on request. Tekna TCK series is equipped with a manually priming pump for start up. The pump is furnished with a complete standard installation kit, which includes: PVDF foot filter and injection valve, PVC suction tube, PE delivery tube. A PVDF-T installation kit is available on request.